#13 Syracuse (7-2, 4-2 ACC) has a chance to turn a page in program history against the Louisville Cardinals (2-7, 0-6 ACC) this Friday night in the Carrier Dome. The ACC matchup will be Syracuse’s first game in the Carrier Dome as a ranked team since 2001. Friday’s contest comes a week after the team secured its first ACC road win of the year, a 41-24 victory over Wake Forest. Senior quarterback Eric Dungey has already ran for 10 touchdowns this season, surpassing last year's total of 9. Dungey leads the Orange in rushing yards. The visiting Cardinals have won their last four contests against the Orange by a combined 126 points. That win streak is the longest in series history between two teams who have played nearly every year since 2003. Last year’s matchup saw Louisville win 56-10, the largest margin of victory by either team in series history. Despite poor showings in past years, the Orange are favored by many oddsmakers to win by more than 20 points on Friday. This has a lot to do with the departure of 2016 Heisman Trophy winner Lamar Jackson to the NFL’s Baltimore Ravens. Jackson put up over 5,000 yards of total offense with the Cardinals in both 2016 and 2017. In comparison, this year’s Louisville offense has just over 3,100 total yards through nine games. The team would have to put up over 600 yards of offense per game for the rest of the season in order to match Lamar Jackson’s total yardage produced in either of his final two years at the school. WAER's Cooper Boardman details Louisville's struggles since the departure of one of the most dynamic players in college football history, Lamar Jackson. Louisville’s defense isn’t doing much better than the offense. Just last week, head coach Bobby Petrino’s team gave up 77 points to Clemson. This came just a week after giving up 56 to Wake Forest. Syracuse’s defense gave up 27 points to the Tigers and 24 points to the Demon Deacons in meetings between the teams this season. The Cardinals have allowed an ACC-worst 367 points so far this season. At the same time, this year’s Syracuse football team is better than teams from years past. This is partially in thanks to starting quarterback Eric Dungey remaining healthy enough to play all nine games of the season so far. With his first snap on Friday, Dungey will have played in ten games in a single season for the first time in his college career. One reason for this has been the improved run game forcing Dungey to drop back less and take less snaps overall. The Orange offense has ran for 1,835 yards and 27 touchdowns so far this season compared to 1,938 yards and 16 touchdowns in all of last year’s campaign. The Syracuse defense has also stepped up this year. Defensive ends Alton Robinson and Kendall Coleman are tied for fourth in the ACC with seven total sacks each. When the opposing quarterback does manage to get a pass off, the Orange defense has been more consistent in making plays on the ball. Freshman safety Andre Cisco is tied for second in the ACC with four interceptions on the season. The entire Orange defense intercepted four passes on the entire 2017-2018 season. Redshirt junior Christopher Fredrick is another member of the ‘Cuse secondary who is exceeding expectations. The starting cornerback had one interception all of last year. This year he is tied for fourth in the ACC with three interceptions and three regular season games remaining. Syracuse’s second and final Friday game of the season will also be the team’s senior night. Dino Babers' squad has 16 seniors listed on the roster, many of whom receive significant playing time. The most notable of these seniors is the program’s all-time leader in total offensive yardage, Eric Dungey. A rushing touchdown on Friday would be Dungey’s 31st of his career. The senior quarterback ranks third in all-time rushing scores for the Orange, most recently breaking a tie at 29 with former SU running back James Mungro. Tune in to 88.3 FM at 6:30pm this Friday to catch Countdown to Kickoff before #13 Syracuse takes on Louisville at 7pm. A win would give the rising Syracuse football program eight wins in a season for the first time since 2012. That season was Syracuse’s last year under head coach Doug Marrone, as well as the team’s last season in the Big East. The 2012-2013 season concluded with a Pinstripe Bowl victory for the Orange. 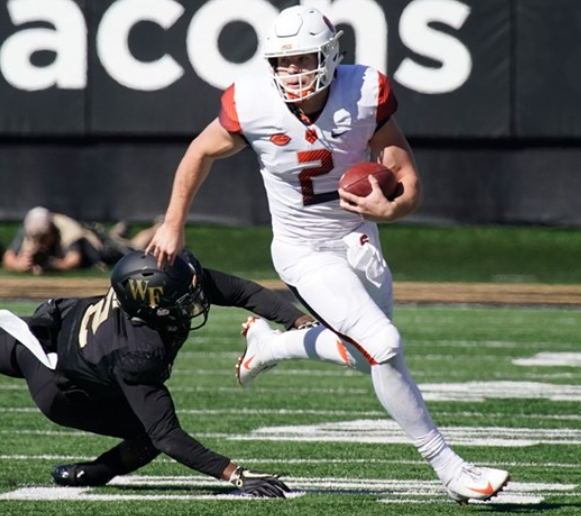 Louisville and Syracuse are set to kick off at 7pm, but tune in early for WAER’s Countdown to Kickoff to get all the information you need to know heading in to Syracuse’s final home game of the 2018-2019 season.